Up to five loans within one line of credit. 2.99% APR is an introductory rate valid for the first twelve (12) months of the loan. Thereafter the interest rate adjusts monthly based on the Wall Street Journal Prime Rate (5.50% on 3/31/2019). Unlike most, Coastal Heritage Bank offers a Home Equity Line that doesn’t require you to choose between a revolving line of credit and a fixed rate loan when you apply. It’s called Coastal Plus Home Equity. You can borrow on your revolving line of credit and then, if you choose, can ask to convert a portion (or all) of the amount you’ve borrowed into a fixed-rate installment loan. You can have up to 5 fixed-rate installment loans outstanding at one time, without having to go through another application process. The amount available on your credit line will be reduced by the total balance(s) of your installment loan(s). As you pay down the balance of the installment loans, the amount available to borrow on your credit line will be replenished. See our variable-rate program disclosure for more details. The revolving line of credit has a variable rate of interest that can change monthly. Each fixed-rate installment loan associated with the account has a fixed rate and fixed payment amount for the term of the installment loan. The rate is determined at the time of the conversion and depends on the term of the loan. Ask us about our current rates and terms. 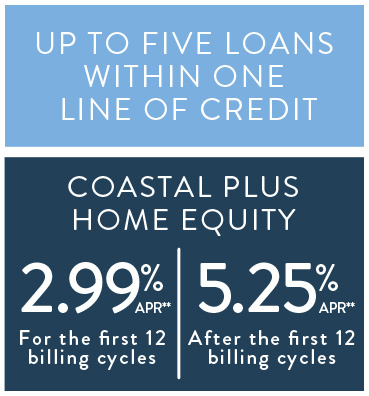 Each month you will receive a Coastal Plus Home Equity statement. If your payments are set up for Auto-Pay, they will be made automatically. If you’ve converted some or all of your revolving balance into one or more fixed-rate installment loans, the monthly statement will also provide information about the installment loans. You will also receive a separate bill for each installment loan. If you do NOT authorize automatic payments, simply use the bill from your monthly statement to make the payment due on your revolving line and the separate billing notices you receive for each fixed-rate installment loan. The Bank is prohibited by law from releasing loan proceeds for a period equal to three business days after the mortgage closing date, if the loan is to be secured by your principal dwelling (primary residence). You may then access your credit line simply by writing a check. We will provide you with a set of 12 checks bearing your name(s) and address. Please keep a record of all checks you write against your Home Equity Credit Line. Your canceled checks will not be returned to you. During the draw period, you can convert all or a portion of your revolving balance into a Fixed Rate Installment Loan. You can have up to five (5) installment loans open at any one time. If you have any questions about our Coastal Plus Home Equity Line, contact our Consumer Loan Department for assistance at (781) 796-6038. **2.99% APR is an introductory rate valid for the first twelve (12) months of the loan. Thereafter the interest rate adjusts monthly based on the Wall Street Journal Prime Rate plus 0% for the life of the line (5.50% on 3/31/2019) or Prime Rate minus .25 with auto-payment from a Coastal Heritage Bank account. Maximum annual percentage rate (APR) is 18%, minimum APR is 3.00%. Available for owner-occupied residences only (1-4 family property or condominium). Loan-to-value limits apply. Property insurance is required. Flood insurance may be required. Homes currently on the market or planned for sale within a year are not eligible. Offer, rates and program subject to change without notice. Offer valid for new customers only. Customers with an existing Home Equity Line of Credit are not eligible for the special introductory rate. Consult your tax advisor about deductibility of interest. Subject to credit application and approval. Please call for additional details and requirements. ALL RATES, TERMS AND PROGRAMS ARE SUBJECT TO CHANGE WITHOUT NOTICE. The HEAT Loan Program provides consumers the opportunity to apply for a 0% loan to assist with the installation of qualified energy efficient improvements in their homes. The loans are available up to $25,000 with terms up to 7 years. To qualify for the loan, the customer must own a one-to-four-family residence, obtain a Mass Save Home Energy Assessment, and install qualified energy efficiency measures recommended by a Mass Save representative. Additional qualifications and restrictions may apply. Customers should visit the Mass Save website, masssave.com, for program details and requirements. The online home equity loan application takes about 20 minutes to complete and will ask you questions about your home and finances. Once you complete and submit your application, we’ll review your request for approval. There is no cost at all for completing the application. After your application is completed, a Loan Officer will contact you within 24 hours (excluding weekends and holidays) to introduce him/herself and answer any questions you may have. Your Loan Officer will then send you an application kit that contains papers for you to sign and a list of items that we will need to verify the information you provided during the online application. Your Loan Officer is available to answer any questions and guide you through the process. Different types of appraisals are used based on your finances, the type of property, and the loan amount requested. We will review your financial profile and compare it to the guidelines for your chosen product. We will review the documentation received from you to verify the information you provided during the online application. Upon approval of the documentation, you will receive a written commitment of the equity line terms and conditions. The Loan Officer will monitor the application process through to the closing. Processing includes the verification of your financial information, collection of documents to satisfy any conditions of the loan commitment, and a review of the tax assessment or appraisal of the property. Please feel free to contact the Loan Officer and he/she will be happy to answer any questions you may have. The Loan Officer will contact you to arrange a closing at one of our branch locations convenient to you. The loan closing is a meeting with you and the Loan Officer or Branch Manager to finalize the loan transaction. During the closing, paperwork associated with the transaction will be signed and witnessed and final arrangements will be made for the disbursement of the loan proceeds. If the loan is to be secured by your primary residence, Federal and State Laws require that you have three business days to decide positively that you want this home equity loan after you sign the documents. This means that the loan funds won’t be disbursed until three business days have passed. The Loan Officer or Branch Manager will provide more details at the closing. That’s all there is to it! Apply now and begin the most efficient way to apply for a home equity loan. For more information, please call or visit any one of our convenient branch locations.